I think that is all the trees planted for this season, we have planted eight fruit trees in the Empty Common Community Garden and 20 fruit trees on my land. Planting should be done between December and March and times of heavy frost should be avoided. In heavy clay soils which are likely to remain waterlogged I would plant out later in the season. On other soils getting the trees in earlier gives them more time to get established before the growing season starts. It is important not to let the bare roots dry out so plant out immediately if possible. If this is not possible bury the roots in a shallow hole ensuring all roots are covered and damp. Planting trees is a lovely pastime where thoughts drift into what the future holds in a very positive way. Get the tree I’m going to plant. Check its roots and prune away any damaged parts. Remove any plastic ties or tight labels. If I’m planting a pot grown tree I make sure the pot is well soaked before removing the tree. 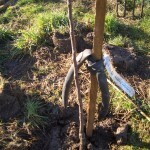 I then plant the tree as with a bare root tree. However if the roots are very tightly bound in the pot and can be loosened easily I might do a little teasing out but not if it is going to damage the root system. 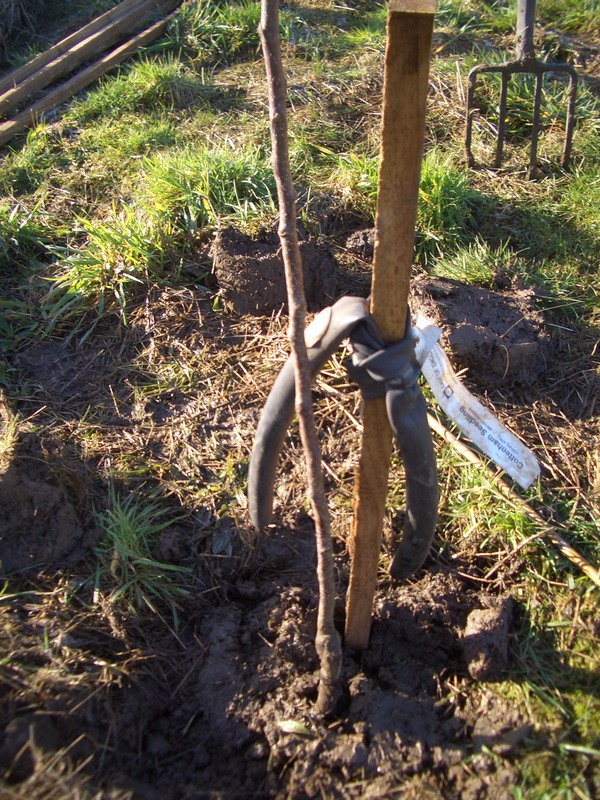 Dig a hole that is a few inches larger than the root system in every direction when the tree is held at the height where the soil is the same level as it was when the tree was dug up – never bury the graft (the union between the rootstock and the scion) . Sometimes this means a wide shallow hole with a cut going off sideways for one super long root. Sometimes it might be a smaller deep hole. Never make a completely circular hole as the roots then tend to go around the circle as if in a pot. If they find a corner then they tend to penetrate through at that point. Try to dig the hole on the day you are planting otherwise it may fill with water if the weather is wet. Loosen the earth in the bottom and sides of the hole with a fork. Digging the fork in and then rocking it back and forth. Clear an area of roots to mark a space where the stake can go that won’t damage the roots but will be 5 -8 cm ( 2- 3 “) from the tree trunk. This should be in the direction of the prevailing winds so when it blows the tree pulls away from the stake rather than leaning towards it. This is generally SW in England. Remove the tree and hammer the stake in. 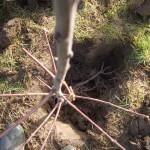 Stakes on larger rootstocks are only needed for a year or two and can be short (1 meter ( 3’3″ ), hammered in to knee height is generally fine). The point of the stake is to hold the roots steady, not the trunk. Trunks grow stronger if they are allowed to bend with the winds. Sometimes you may see stakes hammered in at an angle, this is fine if you don’t have nibblers like rabbits and deer. Rabbits have been known to walk up angled stakes and eat the tree bark from up there. Angled stakes also make it more difficult to put on larger tree guards and to manage the grass around the tree. Into the removed earth and that in the base of the hole you can fork in a small handful of bonemeal if you like. This year I also added a sprinkle of mycorrhizal inoculant bought from a garden centre and a little earth from the wooded area nearby as my own local mycorrhizal inoculant. 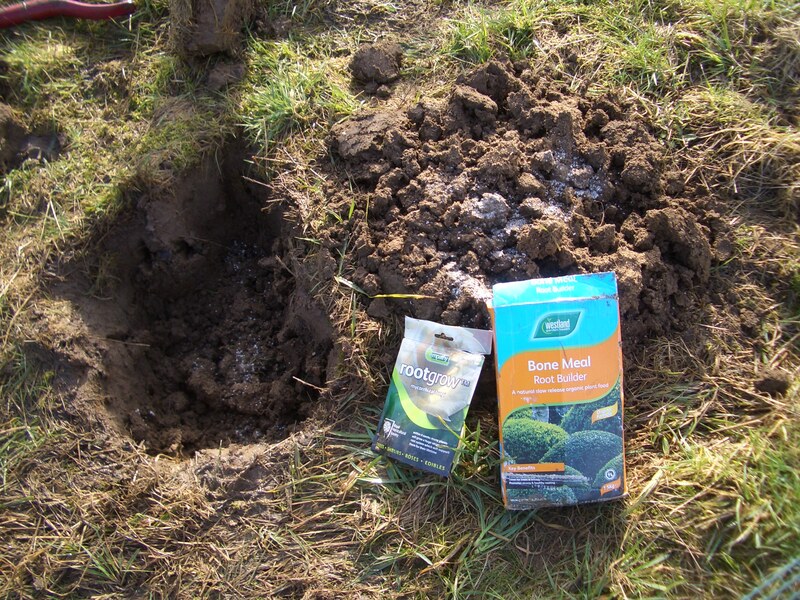 If you are planting in clay soils don’t be tempted to add lots of lovely organic matter or soil improver as this will cause the original clay hole to act like a bucket and hold water – so drowning the roots. Replace the tree so it is 5 – 8cm (2 – 3″) from the stake and at the same height as it was before being dug up, carefully arranging the roots as they wish to lie and supporting them with soil in this position. 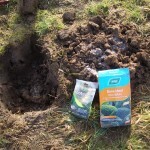 Place the earth back in the hole making sure it fills the gaps around the roots and firm it in gently with your foot. The turf removed from the surface can be laid on upside down to reduce regrowth of grass. Tie the tree to the wooden stake with a soft adjustable tie. I use half a bicycle inner tube for this; tying it to the stake and then to the tree. Fit a tree guard to suit the circumstances. Where there is longish grass there will probably be voles so a small spiral guard at the base is almost always a wise precaution. Where there are rabbits a taller spiral or mesh guard about 45cm ( 18″ ) will be necessary. I have deer on my land and ended up putting seperately staked large mesh guards 1.2 metres ( 4′) high around the trees. In the community garden I just put vole guards on. Watch out that the tree guard doesn’t rub against the tree when it is windy. Water in the soil but avoid overwatering especially in heavy clay soils. Mulch around the tree for about 60 -90cm (2 – 3′). This is important, especially where there is grass competing (See “Orchards (2) Poor Pear Trees” blog). I have not done this yet as the soil is still cold and mulching will delay it from warming up. When I do mulch I will use cardboard with hardwood woodchips on top in the community garden. On the land I will use some woodland soil, then cardboard followed probably with spoiled hay. Cardboard boxes from bicycle shops are great, being both large and thick and you can get some old inner tubes for tree ties while you’re there. Where I have large tall tree guards I will put weed control fabric weighed down with gravel within the guard so it stays weed free for years without remulching. This is because it is fiddly and difficult to weed or re-mulch within the tree guard and organic mulch should always be kept a little bit away from the tree’s trunk. 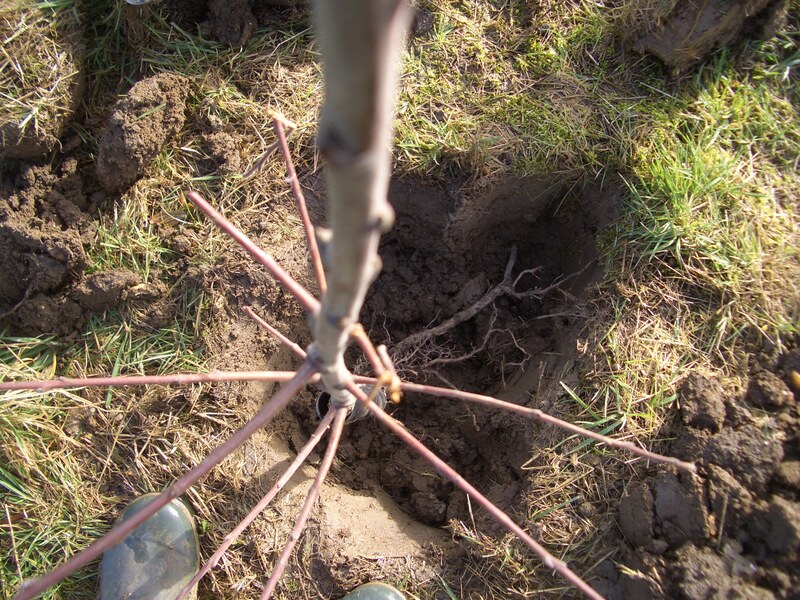 Start the formative pruning process on apples and pears and wait until summer for stone fruit.This is a whole different subject – but one not to be neglected. It is during the first five years that the long term shape and structure of your tree will develop and without some guidance it may end up with weak branches and a congested structure resulting in disease and poor quality fruit.